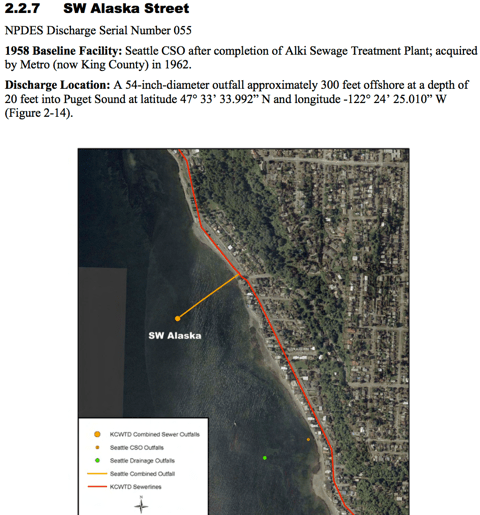 In our continuing coverage regarding the foul Beach Drive bouquet, A small community meeting with representatives from King County Waste Water just adjourned from the sidewalk of 4700 Beach Drive SW. Armed with a color 4 page report regarding the soundness of their sewer, King County says it wasn’t them! 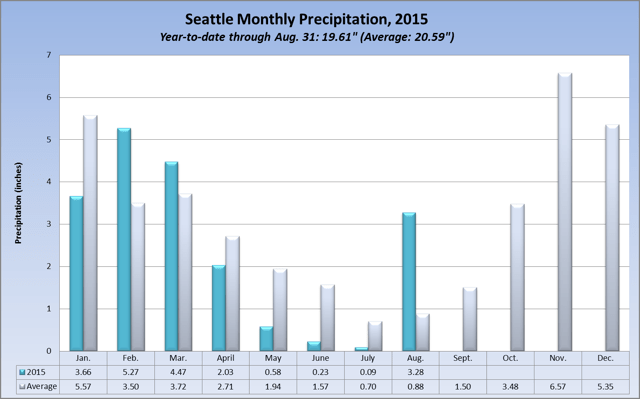 SEATTLE – There’s a 90 percent chance El Nino will continue through this coming winter and an 80 percent chance it will extend to early spring 2016, the National Weather Service’s Climate Prediction Center reported Thursday. When the problem last emerged in 1990, state officials attacked it by corralling the seaweed in nets and hauling it out into the sound, where it was dumped. They did this for three years at a cost of about $10,000 a year, then stopped. The problem abated until this summer, when average temperatures were three to four degrees above normal and the Puget Sound area saw more sunshine than usual. A few residents present at the meeting showed interest in moving forward to find a solution. Maybe consulting with other neighborhoods that have or are currently dealing with this issue would be a good start. We did learn that Dumas Bay click here for their study & Shilshole Pt. were also plugging their collective noses and working on solutions. Beach Drive resident Mark Snyder spotted the nearly 6 foot hulk after peering over the edge of the seawall to see what all the bird racket was about. 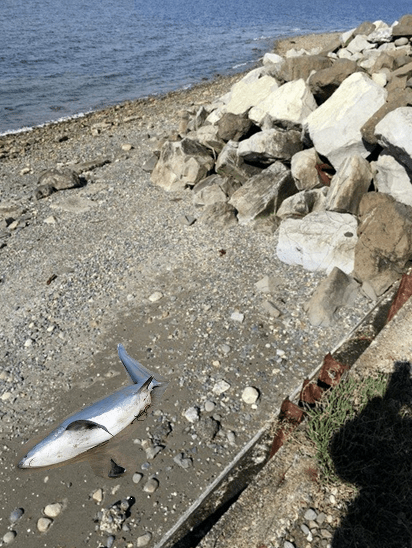 A spokesperson from WSFW believed that it may be related to a species of Thresher shark they’ve been seeing due to the warmer than usual waters off the coast. She also mentioned that ocean going ships will often snag an animal from distant waters and deposit them on inland shores as they reduce speed. A Wildlife boat has been dispatched for tomorrow morning to drag the shark back to the Armeni ramp for proper disposal. 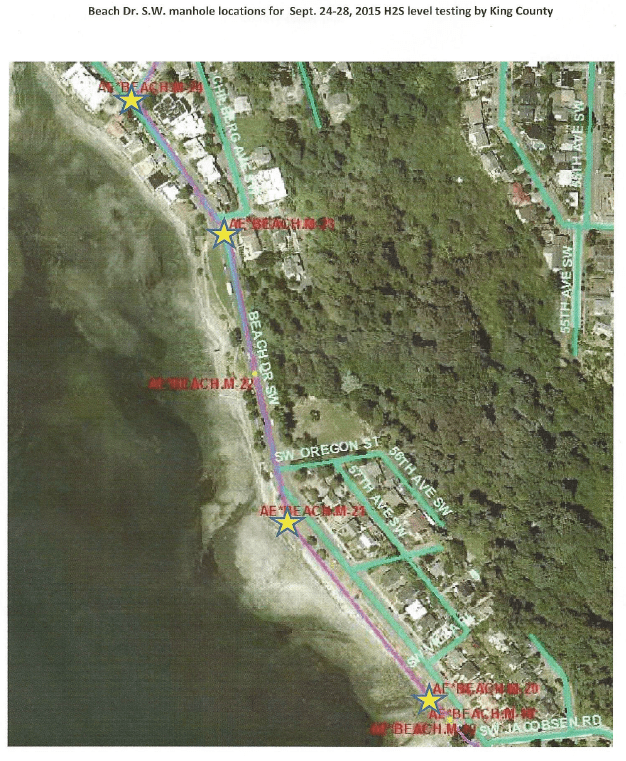 With an official press release due out as soon as this Monday, Beach Drive Blog has been notified by Seattle Parks and the Seattle District of the US Army Corp of Engineers that public comment is now open in regard to the pending seawall replacement for the southern section of Emma Schmitz Memorial Overlook Park. Public Comment closes December 31st 2014. Click here for the Public Notice. Comments may be e-mailed to Melissa.L.Leslie@usace.army.mil. Tanya M King, Public Affairs Specialist with the Corp is very interested in being the single point of contact for any unofficial comments or concerns residents may have regarding the project. There are several different public entities within the immediate scope of the project (Seattle Parks, King County sewer and road, City of Seattle utilities & sidewalk, etc) and Tanya is committed to work with all jurisdictions to get your answers “it may take a day or two or even longer in some cases, but I will do my best to make life easier for residents looking for answers or expressing concerns”. Please see Tanya’s contact info at the bottom of post. If approved by the federal government, the Seattle Parks Department will be entering into a cost-sharing agreement for replacement of this aging structure. 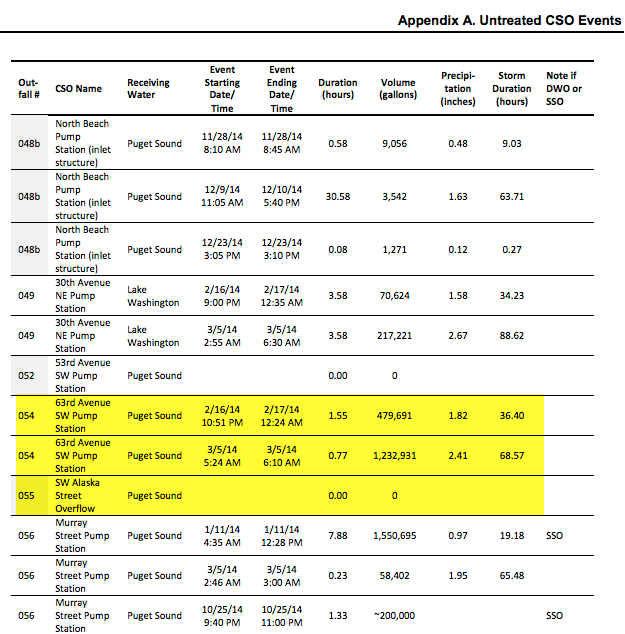 Project design and construction would actually be executed by USACE. Please note there is currently a public review period open for the proposal, and comments must be received by December 31, 2014. Beach Drive Blog asked Tanya to confirm a few specifics regarding the project. She responded before I could even finish the post! Is any type of railing going to be installed? Too early to tell. Not to that level of design stage yet but it would be built low if built at all. What if any new landscaping will there be? Would work with parks dept. 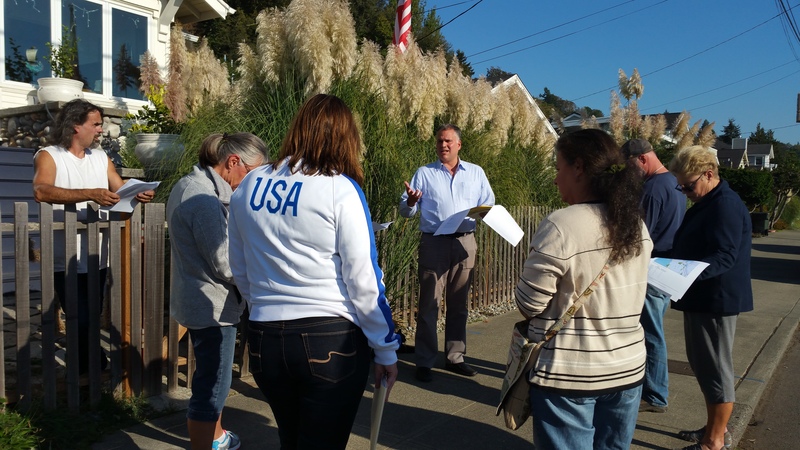 but low native shrub/vegetation is what we’d expect in respecting neighbor’s views. 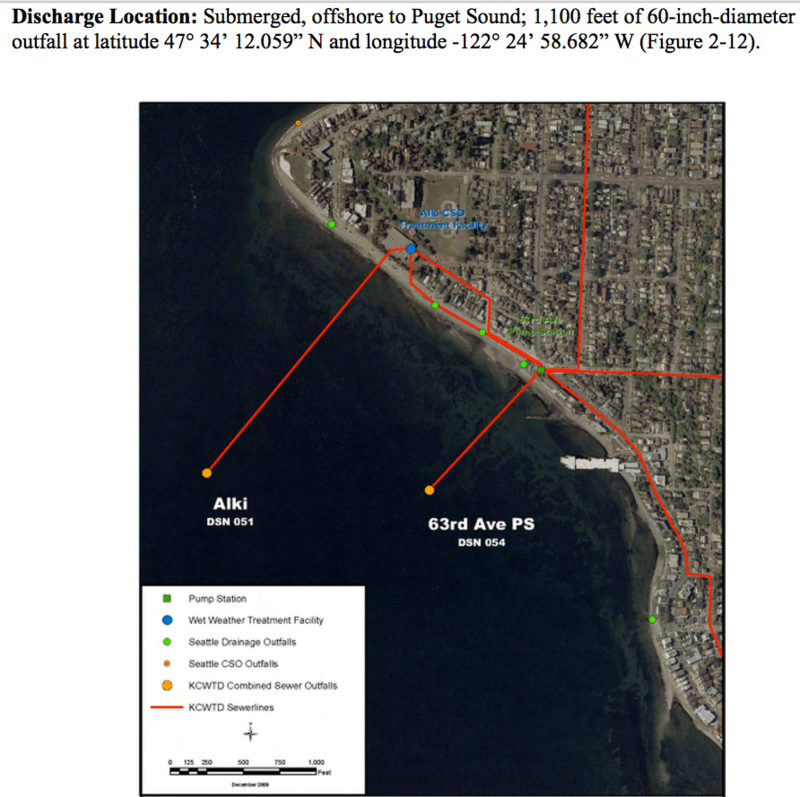 Due to the close proximity of the sewer main to the existing seawall structure, moving the alignment of the new seawall landward was assumed to increase the risks of potential failures during construction and significantly increase overall costs of the project. Therefore, the decision was made to move the alignment slightly waterward and mitigate for any nearshore (beach) area lost as a result of the project. A small amount (0.02 acres) of beach would be lost due to the footprint of the new seawall. To offset the loss of habitat, the project would reclaim adjacent beach habitat by removing a portion of riprap placed in the 1998 City of Seattle emergency repair. This entails lengthening the amount of seawall installed in order to stabilize the shoreline back to or near its pre- 1998 alignment and removing the waterward riprap and fill materials. The proposed ratio would be a 1:1 replacement as this habitat reclaims the lost habitat imposed by the new seawall and could begin to function immediately post-construction. 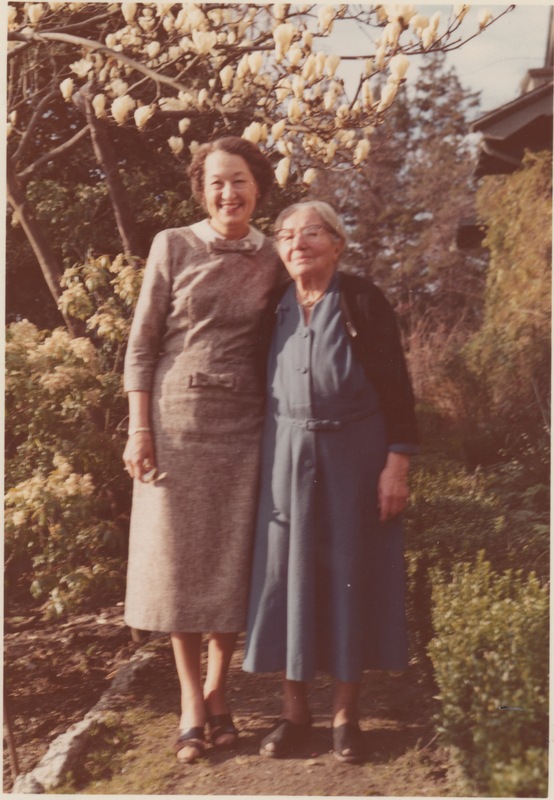 This 1940’s photo shows Emma (on right) with her daughter-in-law Frankie posing beside the old family mansion that once stood where Mee-Kwa-Mooks Park is now. Courtesy of Bob Thomas who found the photo in an attic of a property he now owns. Is it safe for Fido to get in the water? Numerous articles and publications regarding algae blooms have been circulating throughout local government sites and are now making their way around local West Seattle veterinarian clinics. Now that our family has added a virtual land seal (Scupper Jr.) to the pack, I figured it was wise to know more about the safety of dog paddling along our Beach Drive shores. This bulletin (commonly found in many states) has stirred up some confusion as to the safety of pets swimming in or around the algae blooms commonly seen on our marine beaches. As far as I can tell, these warnings are targeted specifically for lakes, ponds, rivers and non-moving estuaries. ALTHOUGH, I do have major reservations letting our pup thrash around in the colorful Puget Sound soup known as Noctiluca. "They know for sure they have large amounts of common Noctiluca algae, which looks like tomato soup, but they have not identified several other strains they observed." Conclusion: Your pets are likely to be just fine after swimming around these blooms but until I hear more, it's "Scupper, leave it!"